UVW Frame for 3dsmax 6, 7, 8, 9, 2008, 2009, 2010 and 2011. UVW Frame is a suite composed of two plug-ins, a helper that displays a frame in the viewport, and a modifier that converts any mesh that is inside this frame to a UVW mesh for another object. UVW Frame allows the artist to manipulate the UVW mesh in a 3D viewport, to use the Editable plugins on this mesh, and to use as many modifiers as he likes. The only restriction UVW Frame imposes is that the Target mesh and the Source mesh have both the same topology (same number of faces, and the faces must have the same number or edges). 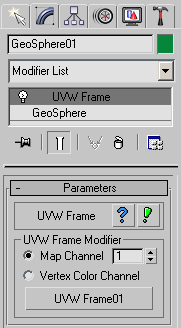 The UVW Frame helper is the frame itself. Pick Unwrapped Object : This button allows the user to pick the Source mesh in the viewport. Save : This button allows the user to save the Source mesh in UVW format compatible with Unwrap UVW. Load : This button allows the user to load a UVW file. This actually creates the object in the scene. The modifier applies the new UVW mesh to the Target mesh object. Map Channel / Vertex Color Channel Radi button : Allows the user to define to which channel the UVW will be applied. Map Channel : The map channel to which the UVW mesh will be applied. Pick Button : Allows the user to pick an UVW Frame in the viewport. Create any primitive object in the viewport (Sphere, GeoSphere, Torus, etc..). Name this object Target. Clone this object (select Copy option) and move this clone to the side. Name this object Source. Create a new UVW Frame that fully encloses the Source object ( Create panel > helpers > UVW Frame ). Go to Modify Panel and click the Pick Object button and select the Source mesh in the viewport. Apply a material with a bitmap texture to the Target object. Enable Show Map in Viewport. Select Target object. In the Modify Panel apply an UVW Frame modifier to it. 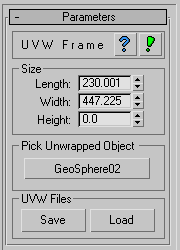 Click the pick button ( named None ) and pick the UVW Frame object in the viewport. By now, the Source object's UVW mesh is linked to the Target object's mesh by the UVW Frame. This is an active link. If you move the Target mesh, or the UVW Frame, the UVW Mesh in the Source object will be affected in real time. Convert Source object to an Editable Mesh, select it's bottom faces and Detach them as a new element. Rotate the new element so all faces are facing up, and move them to the side. Increase the size of the UVW Frame as needed. Apply a Relax modifier to the Source mesh. Increase the iterations to remove all UVW stretching from the Source object.